In most movies, there is a post shoot processing, which gives the movies a distinct look. Often this color grading is based on certain pre-defined presets or let's say themes. Now, every time I see a David Fincher movie, I can almost tell, they have a distinct look. Something yellowish or may be something else. I mean you can take any movie since Zodiac. Zodiac, Curious case of Benjamin Button, Social Network, The Girl with Dragon Tattoo, all of them have the same look, which is different from other movies. So much that when you see a trailer, you can almost tell that it is David Fincher movie. Actually I want to know about this particular look. How to define it more? Is it some kind of preset or is there a name for color themes like that? Can someone please throw some more light on it? There doesn't seem to be a specific term for the particular color grading that David Fincher uses for his movies, other than "Fincher look". I also don't think he employs some kind of predefined color palette rather than tweaking each and every movie for its specific intended style (but one might be tempted to say that Fincher's movies often share a similar dismal atmosphere in the first place anyway). Yet, I (and many others) agree that many of his movies, while each colored individually with various different tools, share a common prevalent color theme, which you described not too inappropriately as yellowish or greyish/bleached yellow/green or, more generally, dark, sometimes desaturated. And there are various interesting articles concentrating on this color palette and trying to further describe it. The interesting article "David Fincher: Into the Darkness" tries to describe Fincher's visual style by looking at some of his more recent projects, coming to the conclusion that he employs a very dark upto bleak but clear-cut and ultimately realistic tone, which the author calls "Dark Clarity". From the first scene in a bar...a new aesthetic was displayed in The Social Network. It’s dark...but not with crushed blacks. As a viewer, there is a difference between crushed blacks and compressed dynamics of light. There is clear detail in the shadows but the highlights are lowered and colored. If 100% is pure white light...many of the whites in Fincher’s last 3 projects are at 90% (roughly) which constricts the perceived latitude of the image. These whites are also tinted towards the overall color of the scene. Orange is infused into both day and night scenes in The Social Network. Often blue is the go to night-time color but not so in The Social Network. The Girl With The Dragon Tattoo display a continuation of this visual palette. In the winter setting of ambiguous sunlight and endless night...Fincher again compresses the whites and keeps clean and legible blacks. Even though so much occurs at night...the viewer never struggles to see what is occurring or gets lost in the visuals. From glass-lined offices to night-time exterior excursions... everything is pristine and clearly visible even when the light levels are extremely low. [...] The tinting of both orange and blue to entire scenes further blends the color palette of scenes and delivers a very hyper-real look. Most recently, GONE GIRL (2014) continues and expands upon the darkness and shrouds the characters within world of buried secrets and impenetrable blackness. Make no mistake...the visual depiction is not murky or muddy...it is a dismal, colorful bleakness that infuses and envelops the film. It matches the tone of the tale. My take-away from watching the last 4 projects by David Fincher is that he’s utilizing quickly evolving technologies (RED, color correction, LED lighting) to redefine the visual boundaries of what is the minimum needed to represent and tell the story. It’s bold and radically different from let’s say...an episode of CSI or Transformers. It’s reality enhanced and a new take on what is considered natural light filmmaking. Then in post production/color grading, the midtones and highlights are lowered to bring down the overall brightness BUT most importantly...the blacks are never crushed so that the shadow detail is always retained. The final image is “Dark Clarity” and matches the mood and tone of his last 3 projects. 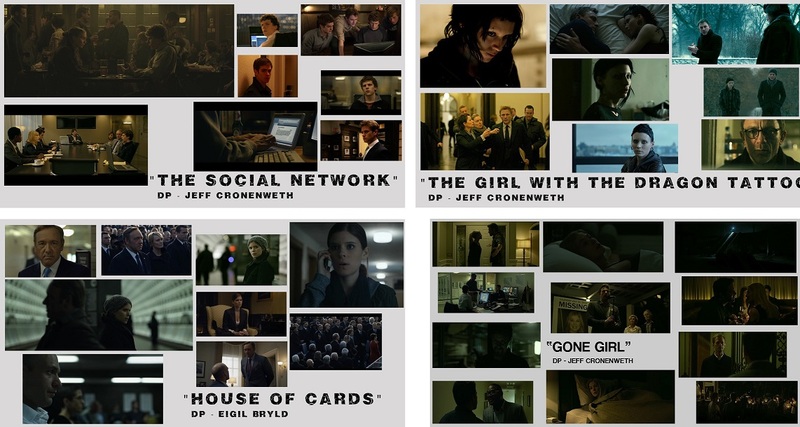 Then there is this blog post on "Achieving David Fincher’s Color Palette", which in order to recreate his color grading gives some interesting insights into its possible composition, getting to the conclusion that it's mostly based on blue-green combinations. Fincher often uses greens and blues. This can be seen in basically every one of his films although, there may be slight adjustments from film to film. For example, in The Girl with the Dragon Tattoo he heavily de-saturates when we see Lisbeth, creating more of a greyish image. Still the overall look is still there. [...] Fincher usually sticks to this template and then further warms up or cools off the image based on the story or the characters emotions. Again the basic template is almost always there. [...] The main idea of this look is fairly simple. When in the grading process your goal is to push the shadows to a blueish/teal. Then push your midtones and highlights to green. David Fincher is also used as an example in a more general article about the ways in which the color of the movie influences and alters its effect, sepcifically that the dark and drab green/yellow of Fincher's movies contributes to the often unsettling moods and themes. David Fincher retains a similar look in several of his movies with the help of Jeff Cronenweth, his cinematographer. In Fight Club and The Girl With the Dragon Tattoo, several scenes are dark, but contain many of the same green and yellow tones. Yellow, an otherwise cheery color, looks drab, sick, and denotes an unsettling space. And last but not least (well, probably not even last) there's the article "Paint it Black?" by another Fincher enthusiast, who agrees that the colors are aften based on dark yellow, green and blue. It goes into more specific details of various different scenes and what their color grading is used to convey. A particular point the author makes is how the colors are used to support the mood of the characters. I'd assume you're talking about the color grading/color correction. You'll find some details about this in the extras on the Blu-ray or DVD releases of his movies. Online there are articles like this and YouTube videos like this (more here). Also note that sometimes he re-colors his movies for home release, here's for instance what happened to Se7en. Not the answer you're looking for? Browse other questions tagged film-techniques david-fincher .